OUR LATEST WORK, THOUGHTS, IDEAS, ASPIRATIONS AND INSPIRATION FROM LIFE AND AROUND THE WEB. Located on Blackhorse Road in Exhall, Coventry, The Early Learning Camp is a day nursery and pre-school facility for children. Their mission is to create the most engaging and caring early learning environment for children from birth to 8 years guided by the Early Years Foundation Stage. Offer children and their parents a service that promotes quality and values diversity. 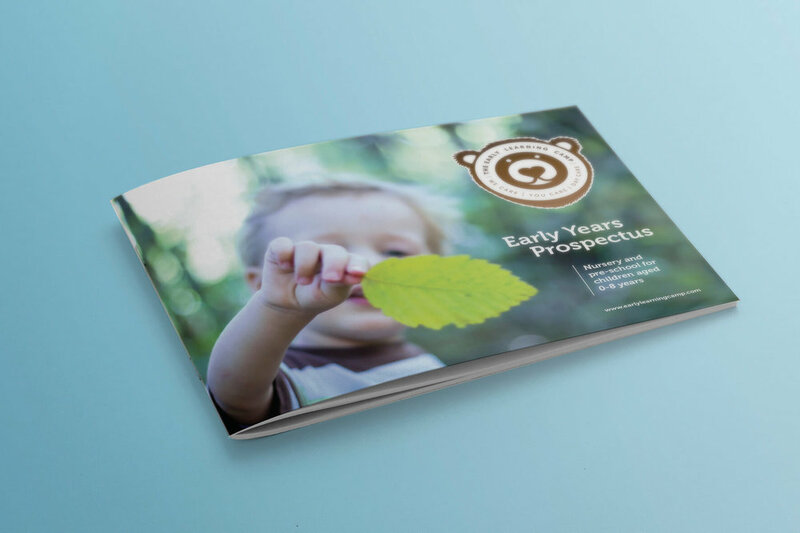 Create Onsight were asked to re-purpose the existing brand after considerable investment in brand new Forest School building at The Early Learning Centre in Exhall, Coventry. The aim of the new building was to encourage more outdoor learning whilst following the guidelines of the Early Years Foundation. Create Onsight are an independent creative, web design, graphic design and branding agency. We have an infectious enthusiasm for making things, solving problems, building brands and, most importantly, having fun doing it. 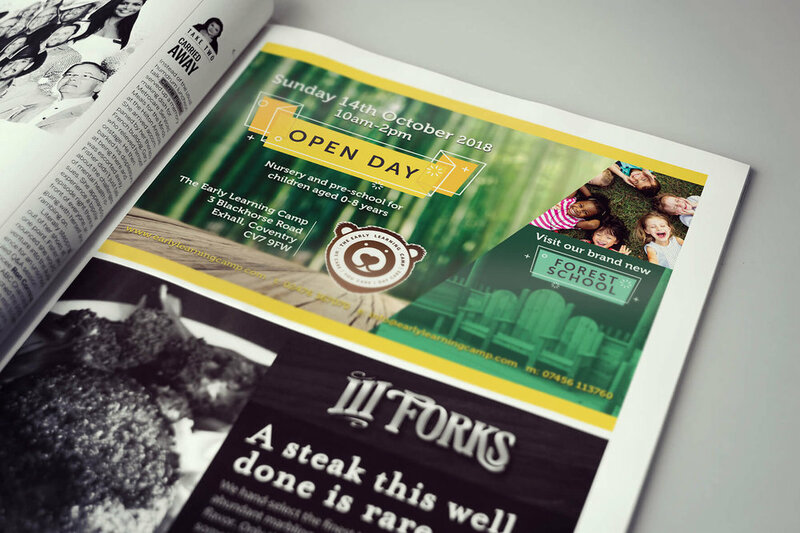 We’ve designed everything from branding and company logos for startups, to strategic marketing campaigns, to web design for e-commerce, to graphic design for brochures, leaflets and annual reports... the list goes on! 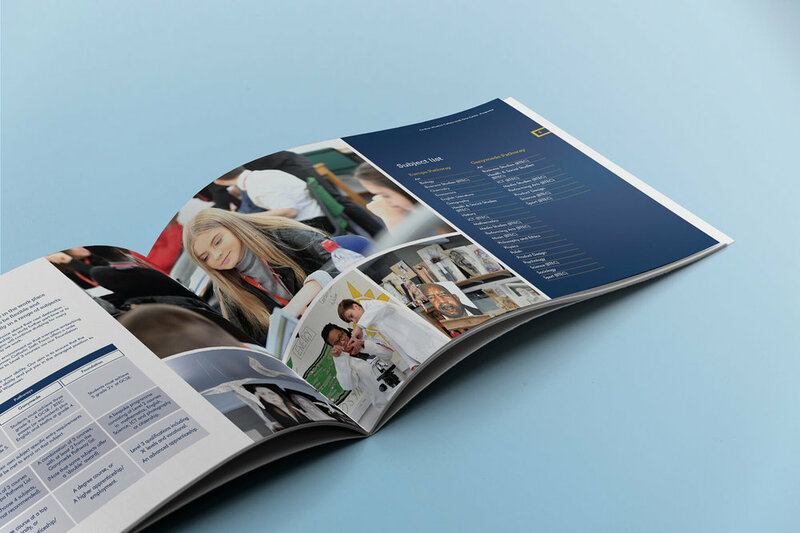 Need a prospectus, annual report or marketing materials for your organisation? Contact our Creative Director, Leigh at design@createonsight.co.uk or by using the enquiry form at the bottom of this page. Christmas is around the corner! A promotional piece for the Belgrade Theatre, Coventry. Let's have a Game Off! Branding and packaging design. Ann Scott is a freelance Illustrator based in the UK. After graduating with a First Class Honours Degree in Illustration Ann has 10 plus years experience in the industry with rights sold in China, Japan, S Korea, Turkey, USA, Asia and U.K.
Ann has worked with various publishing houses, licensing companies, galleries and private clients. She specialises in children’s books and art licensing. Clients include Autopress Education, Rockpool Children’s Books, Bramble Kids Publishing, Ladybird Books, Frederic Thomas USA, London Transport Museum... and many more. I strive to create work that is more than just a picture, filled with personality and a living vibrancy. Illustrations to make people smile and lift spirits. I like to interpret an idea or text in an original appealing way, with a quirky amusing touch. 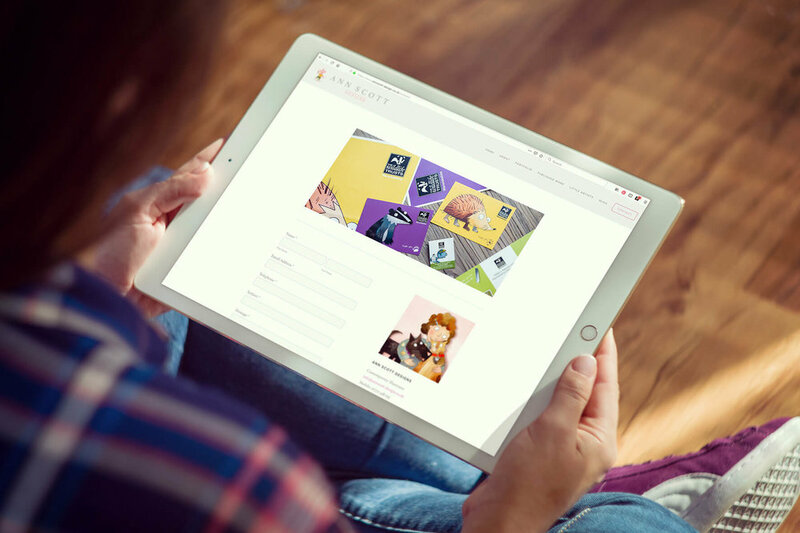 Create Onsight were approached by Ann to rebrand and redesign her existing website, to bring the overall look and feel up-to-date, and make it responsive to smart pads and phones. 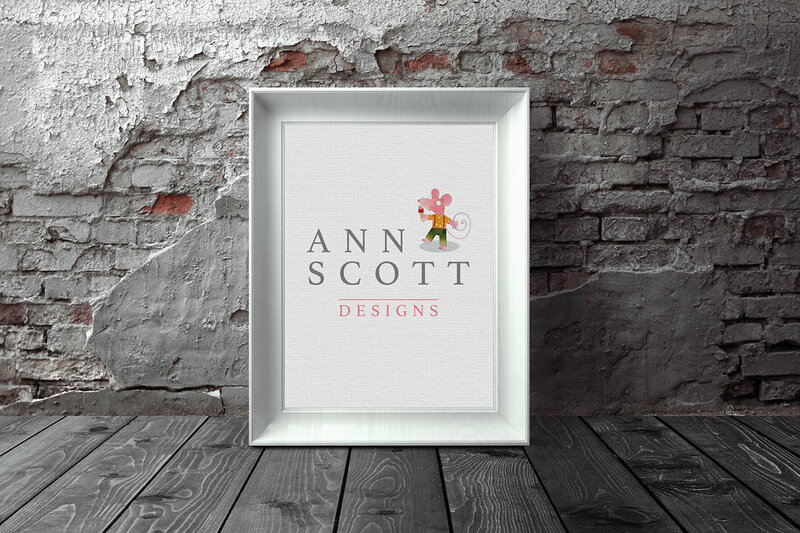 The new logo was designed to be timeless and minimalist, with the focus on one of Ann’s hand-drawn characters to give the logo a personal touch. Many illustrators opt for the cliché signature style logo, so to do something different helps the overall brand stand out from the crowd. 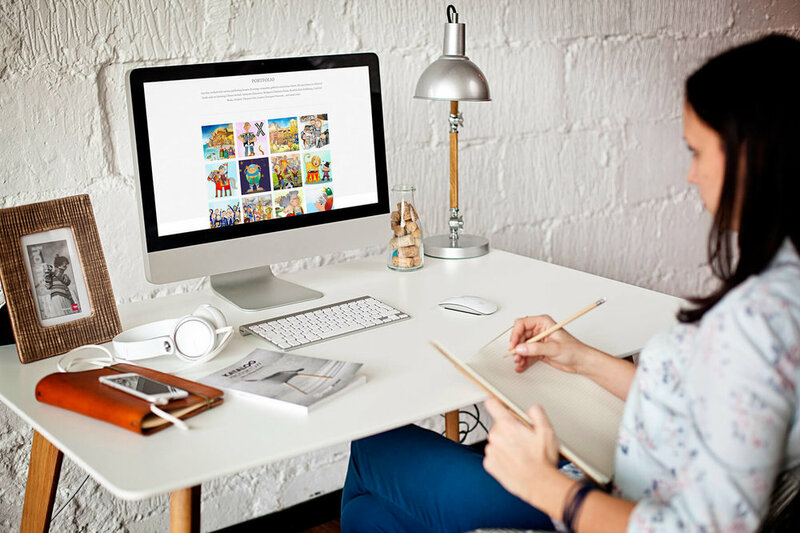 “Portfolio websites are critical for illustrators who want to get exposure for their work and attract new clients. The website is designed as an online portal, easily accessible from any device, with a focus on the artwork rather than the design of the website interface. 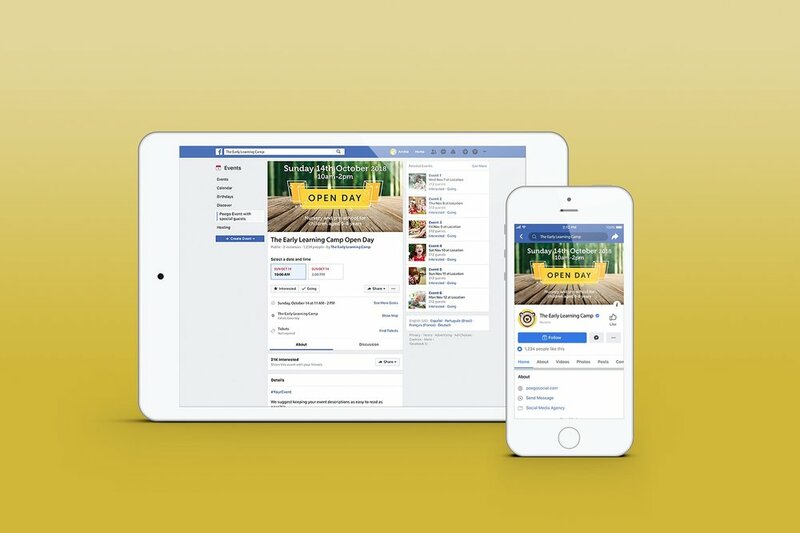 That said, the user journey is very important to us so we take care to make sure that everything is one to two clicks from the homepage, including the online enquiry form. Need a brochure, annual report or marketing materials for your business? Contact our Creative Director, Leigh at design@createonsight.co.uk or by using the enquiry form at the bottom of this page. “Our vision to ‘Create Better Futures’ weaves through our activities at the University, as a centre for academic and research excellence, enterprise and innovation; and in the local and global communities that we are connected to. This year we have continued to grow as a University and also in our approach to sustainability. This report outlines key achievements and recognises we are uniquely placed in what we can offer to society; through beneficial research, education and skills, environmental benefit and our physical presence in the community. 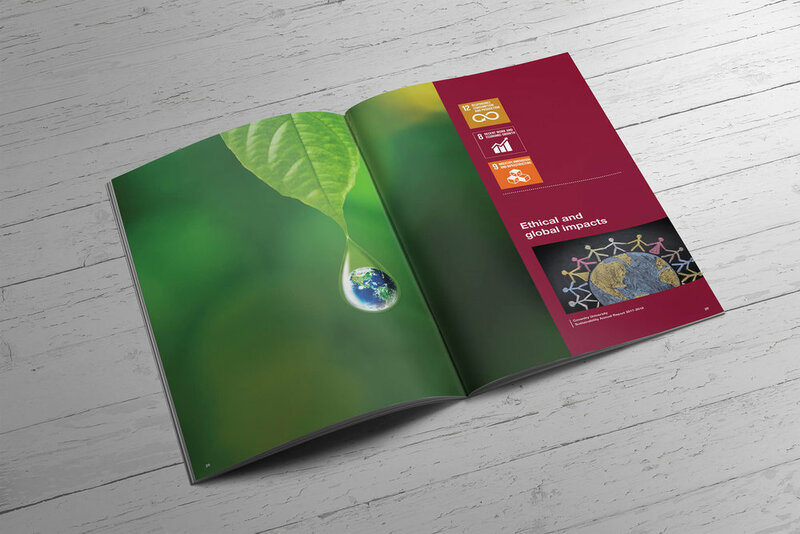 Our brief from Coventry University was to design an Annual Report that demonstrated the Universities’ commitment to sustainability and the environment. 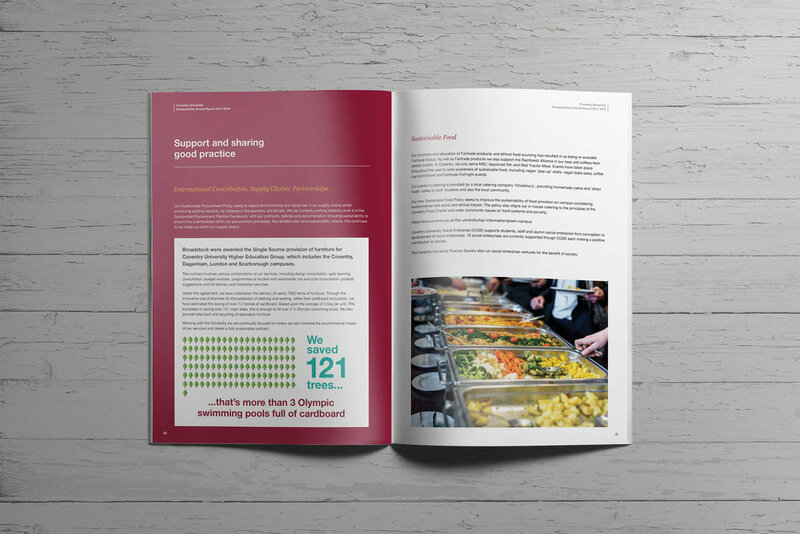 The design is clean and minimal with the use of quality, support imagery to create a spacious and easy to read document. The subsections are clearly defined by colour to enable the reader to access the information quickly whilst retaining a modern, approachable look and feel throughout. This year’s annual alternative pantomime, Over The Top, is a heart-stopping, pun-filled adventure, overflowing with uplifting Christmassy comedy. The year is 1918 and the troops on the Western Front have had a surprise visit from a fearless group of suffragettes who’ve come to perform a show to lift their spirits. But with bullets whizzing over their heads and howitzers shaking the ground, the troupe get stuck behind enemy lines and a rescue mission is needed. Hashtag #FirstWorldWarProblems. Sergeant Beauty and a crack team of daredevils soon set off on the perilous journey to rescue them, but will any of them make it back to Blighty for Christmas? Featuring an all-female cast, this show really is set in No Man’s Land. But fear not, these suffragettes definitely have our vote, and we’ll be rifling through the joke book to make sure the performance doesn’t tank. If you’re looking for a fun-filled night out away from the kids this Christmas then look no further! The Belgrade Theatre Coventry's brief was to design show branding and artwork that reflected the fun and humorous side to their Christmas production entitled Over The Top. We designed the show artwork to appeal to a fun loving audience, blurring the boundaries between classic Christmas and First World War imagery! The finished design was translated into posters, outdoor advertising, flyers, banner stands and online website banners for social media. See below how we created the final artwork by a montaging various images together. Need a new logo, brand or website for your business? Contact our Creative Director, Leigh at design@createonsight.co.uk or by using the enquiry form at the bottom of this page. 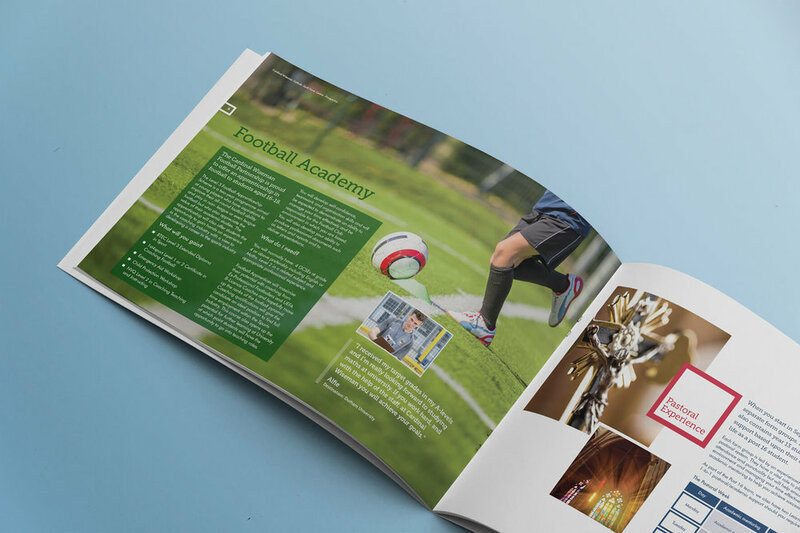 Create Onsight were commissioned by Cardinal Wiseman Catholic School to modernise, update and re-design their school prospectus and marketing materials. The document is used as the main ‘take home’ literature for adults looking to place their children at the school. The school has a rich heritage dating back from 1949 that was reflected in a simple, classy, timeless look and feel. The design uses large imagery of real children working and enjoying classes and other activities within the school alongside informative text on academic areas. We also translated the new look to various banner stands and large format banners used to give examples of the schools outstanding performance. Branding isn't just about visual imagery. Branding is the whole perception from hearing the name of a company or seeing its logo and messaging consistently across all marketing platforms. Designing the imagery and symbols which make a brand recognisable and transferring the appropriate message is a job with great responsibility. Bedroom Gallery - Bringing Ideas to Life. "We specialise in creating the perfect bedroom for you. Being the most private and personal room in your home means each design we create will capture your desires. Our designers work to your brief and help to create an individual style and a look you absolutely love. Luxury Bedroom Interiors and home office furniture done your way." Create Onsight were asked to design and roll-out a new brand for Bedroom Gallery that reflected the quality of their products and services whilst targeting their desired high-end demographic. The final logo design is both stylish and sophisticated yet understated and elegant. The ornate coil within the rectangle is subtly both a ‘b’ and a ‘g’ without being over contrived and obvious. This simple, sophisticated approach is often used by high-end brands from fashion chains to boutique hotels, where less is more and simplicity speaks of confidence and heritage. The new Bedroom Gallery icon was then used to create a pattern motive, or visual language, that was applied across marketing collateral from business cards to wall livery and the website, creating consistency and brand recognition. 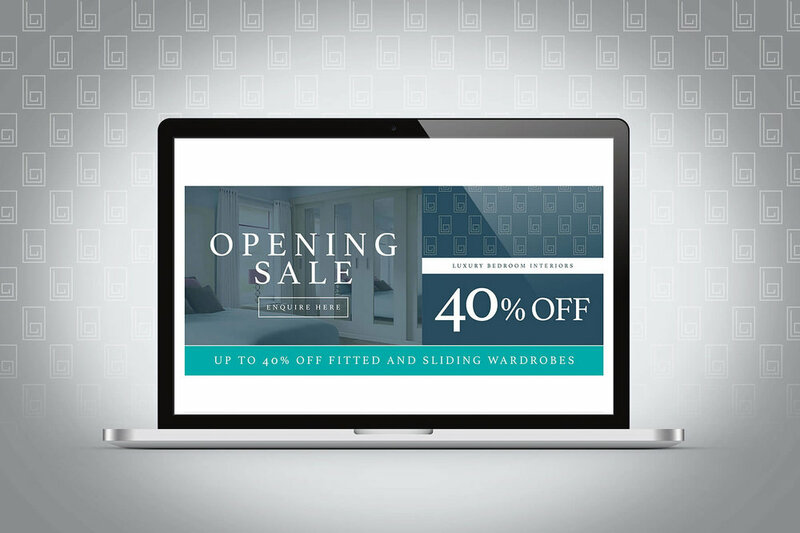 As part of the new brand launch Create Onsight designed and built a fully responsive website showing the various product ranges Bedroom Gallery has on offer. The website is designed to enable users to access information quickly and easily with heavy emphasis on inspiring product photography. Product pages are designed predominantly for mobile and smart pad usage with scrollable pages and slideshow photography of ranges. The overall look of the website is simple and elegant yet heavily product-focussed to encourage enquiries and ultimately sales. Thank you! A member of out team will be in touch with you shortly. ©2019 Create Onsight. Registered in England and Wales 09293636. Please do not reproduce without the expressed written consent of Create Onsight. Web design by Create Onsight.